The inspiration board I created to reference for design decisions while creating the 'Dalmatian' scarf. The 'Dalmatian' scarf sprung from the first idea that I had after deciding that I wanted to design a scarf collection. Keeping an eye out for inspiration, I spotted dalmatian foxgloves on a walk home and my thoughts instantly started churning. Dalmatian Foxgloves, image from Jackson & Perkins. You see, foxgloves were the original idea as the main subject for this scarf's design. I already loved their distinct, dynamic shape, and the charming spattering of little dots gave them that extra oomph where I felt they become something truly worthy of centering a design concept around. To flesh out the idea, I started brainstorming other speckled things in nature, imagining that I would create an elaborate "bouquet" celebrating all things speckled in each corner, continuing it around in a border surrounding an abstract, spotted pattern. My notes read, "Bird (I believe I was referring to their eggs), Pinto, Dalmatian, Cow, Foxglove, etc." However, for whatever reason I started my image research with dalmatians and the rest of the list went out the window. I have very rarely seen dalmatians in my life and truthfully had never given them much thought, but the moment I began perusing images of them for source material I was instantly struck by how innately chic they are. I knew that they were bold, graphic, and dynamic enough to carry the whole scarf—the other elements would just get in their way. Deciding on an athletic dog like a dalmatian immediately opened up another door: the rich history of hunting artwork adorning classic square, silk scarves, many of which either include or solely feature sporting dogs. Most famously, this look is quintessentially Hermès, and I gathered research there. Hermès 'La Poursuite' Scarf and detail section. Hermès 'Chiens et Valets' Scarf details, full scarf design shown in bottom left corner. 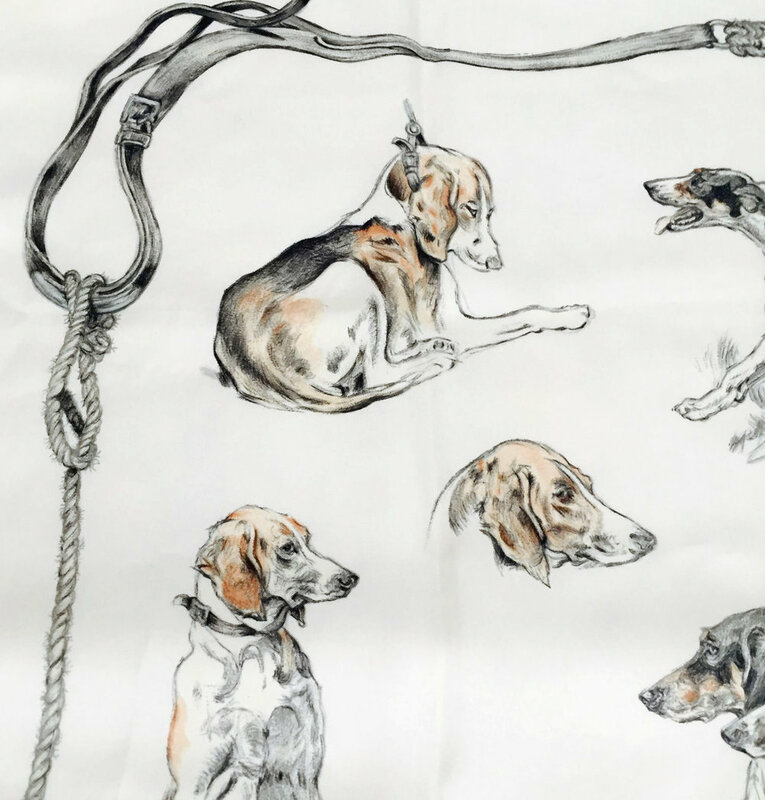 Detail of the upper left corner of Hermès's 'Chien de Meute' scarf. 'Les Teckels' Scarf by Hermès, from Bukowskis. Hermès 'Les Levriers' scarf, details in two colorways. ...and there are many more examples. Due to the graphic nature of dalmatians being one of the main elements that appealed them to me as a subject, I was especially intrigued by the more simplified renderings found in some of the Hermès designs; I kept this in mind when choosing a rendering style for my own paintings. One of the images I drew from when painting my dalmatians. The scanned original paintings I made for the 'Dalmatian' scarf—using only one color, they were essentially line drawings. The final piece of the puzzle was color selection. 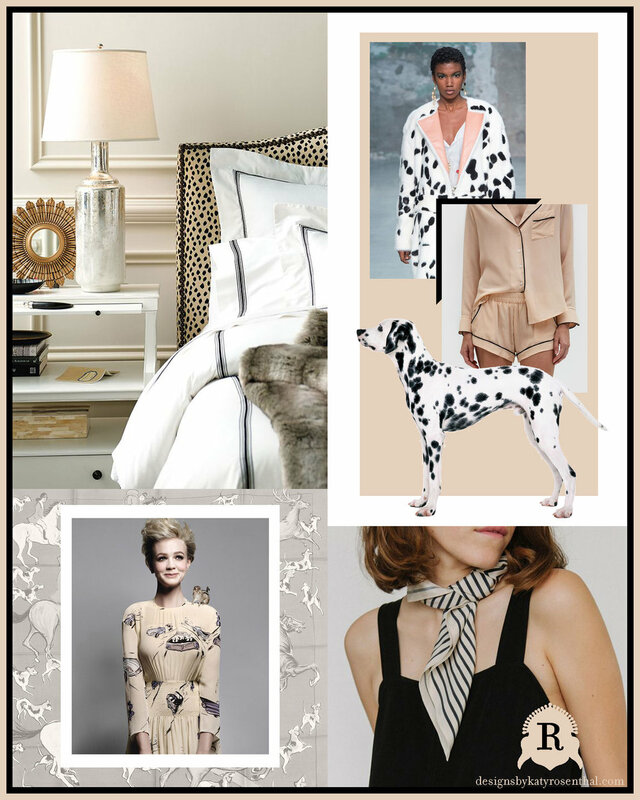 As you can see on my inspiration board, I landed on a very preppy, classic palette of tan, black, and white—in my mind epitomized by the Burberry trench—which I felt was the perfect accompaniment to the dalmatians' sporty elegance. A classic look built around Burberry's iconic trench. Image from Wendy's Lookbook. The 'Dalmatian' design in its final scarf form! Printed with GOTS-certified organic inks on organic ahimsa silk. I hope you feel as taken with the dalmatians as I do—I can't help but feel that the lean, sinuous lines of their form coupled with the striking contrast of their graphic spots could chic up almost any look. Copyright © 2019 Katy Rosenthal, all rights reserved.